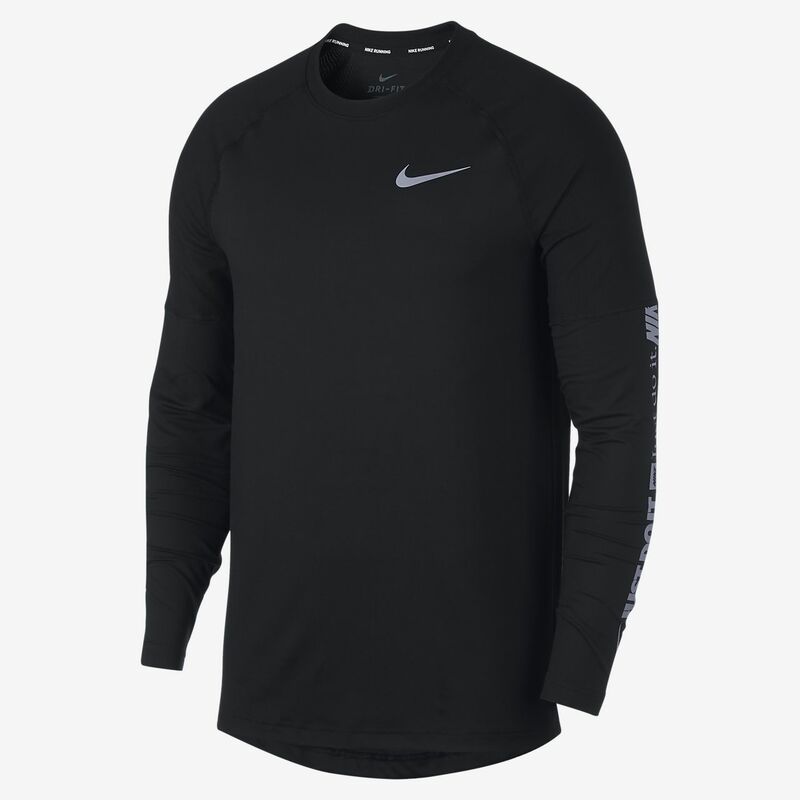 The Nike Element Men's Long-Sleeve Running Top provides warmth that demands to be noticed. The reflective graphic on the arms says "Just Do It" in six languages. Sweat-wicking fabric with mesh on the back works to keep you comfortable as the run heats up. The Nike Element Men&apos;s Long-Sleeve Running Top provides warmth that demands to be noticed. The reflective graphic on the arms says "Just Do It" in six languages. Sweat-wicking fabric with mesh on the back works to keep you comfortable as the run heats up. Slightly curved back hem helps keep you covered as you move. Reflective details help you stand out from the crowd. Looks good. Feels good. It's not cheap, but felt worth the price. The first thing I noticed was the weight - there's quite a bit of material on this long-sleeved shirt. Next was the warmth - as stated in the descriptor on the webpage. Well, it was just that - a feeling of warmth. At no time did I feel hot or stuffy. However, it does differ from the other dry-fit stuff which gives a cooling feeling from the very start. It's a little warm but at no time uncomfortable. I think it will be fine even under the sun or while running; though I still prefer the cooling ones in Singapore's hot weather. Then again, this warmer one did not make it uncomfortable outdoors. Compared to the other cooler, thinner, dry-fit shirts, this one feels more durable. That said, all these kind of shirts are thin, thus under rough usage (soccer, basketball etc. ), will not last. Then again, this shirt is advertised as a running shirt, so well, in that sense, it will last. Unfortunately for me, I'll be using it in all games situation - let's see if it survives the rare rugby game I get into. Sizing wise, it's fine except for the longer-than-normal sleeves. I would've like an XS sizing but not available here in SG. :( Overall, if you can stomach the price, it is HIGHLY RECOMMENDED!